I am a 38 year old single lesbian. I am quite content being single, and it seems other people are more worried about me finding a special someone than I am. In the past ten years I can count on one hand the women I have been ‘interested’ in. That would be two. I was somewhat smitten with both of them, we became friends but both were in relationships so nothing ever progressed with me. We remain friends and I am thankful for their friendship. My question is, should I be worried by the fact that I am rarely attracted to women and don’t actively look to meet anyone? As I said at the start I am perfectly happy but my friends seem to think I should be trying to find a relationship. It sounds like you’re very content being on your own and the only real concern you have is that your friends worry about you. In our society we’re led to believe that we need to be paired or matched to be truly happy. Research tends to support this by showing that when we’re in a healthy, happy relationship we live longer and are healthier physically and emotionally. With that said, I don’t believe that we need to be in a partnership to feel complete. Although it often makes our friends and family, those who love and care for us, feel better when they see us sharing our lives with someone. It’s important to recognize that that’s their anxiety and/or uneasiness, and not something you need to take on. There was a recent article published about American women marrying not just later in life, but less than ever. It is becoming more acceptable to be single, but there is absolutely still the element of societal pressure to partner up. I say give yourself the permission to live the life you’d like to live. If and when you’re ready to be in a relationship, you will know it. Posted February 18th, 2014 & filed under Love. 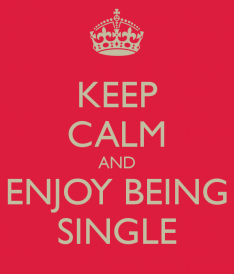 get tired of being asked…..y r u STILL SINGLE? make it sound like a defect.